Henson & Ella with Bobos, originally uploaded by StephLewis. I was out in our yard today with Ella and Caleb. Ella was just sniffing around like usual while Caleb and I were on the swings. Then I heard this loud “Reeeee!” sound and saw three baby bunnies go bolting across the yard in different directions. Ella was standing over something with her tail wagging wildly. Caleb and I went over there and I saw a baby bunny writhing, then lay still. It was so weird because Ella seems like this sweet, caring dog. But, something in her “ran a procedure buried deep in her ROM,” as Josh said. It’s crazy how dogs are bred for specific purposes and there are some things in them that you just can’t train out of them. It reminds me to be extra careful in selecting the breed of dog you want to welcome into your home. 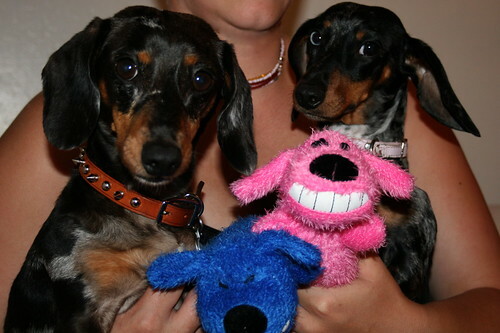 Ella’s breed, the miniature dachshund was developed to hunt rabbits. And that she does. Sidenote: When we were staying with my parents during our in-between California and Minnesota time, Henson was with my dad outside. A rabbit went across the yard and my dad shouted, “Get him!” Henson took off after the rabbit, chased him through the woods, and came back carrying a hunk of fur in his teeth. So, Henson was serious about some bunny hunting too. He passed away a few weeks ago and we miss him, he was our little buddy.